One wrong move, and you could ruin your favorite sweater. But don’t worry! We have a few suggestions and tips to make sure that washing your vintage wool will result in many happy years together. Fill a basin with cold water and plug the drain. Add about ¼ of a cup of gentle detergent and swish the water around to create some soap suds. Fully immerse the piece of wool clothing and allow it to soak for a few minutes. Work the soap and water through the wool garment make sure to NOT twist or wring the article at all. Release the plug and allow the water to drain. Rinse the article with cold, clean water, again remembering to not twist or wring it at all. Continually rinse the piece of clothing until all of the suds are gone. Proceed to roll the wool in an even manner removing all the excess water that may still be in the fibres of the fabric. Place the wool flat on absorbent towels. Fix the article of clothing to be straight on the towels. Air dry the cool on a flat surface. It is important to remember to NEVER use hot water during this process. Hot water will almost definitely result in shrinkage. Also mind the fact that if you hang the wool garment while it is still wet or damp to dry, the piece of clothing will stretch and the process will need to be repeated. Wool is a warm and durable material. But, to make it last, you have to take good care of it. 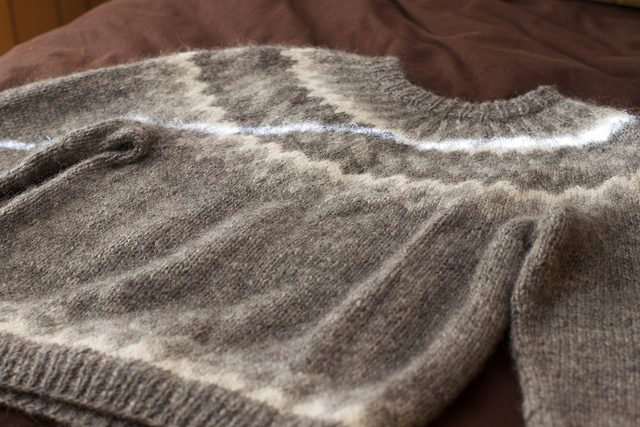 Keep to this process and your sweater will enjoy many more years.